The Pearl Izumi Men's Elite In-R-Cool Bib Short features technical fabrics and a thoughtful design for high-performance comfort on any ride, long or short. The anatomic multi-panel design features flatlock and double needle seams to eliminate chafing, with welded-construction silicone leg grippers to hold the shorts in place. Made from ELITE Transfer fabric with In-R-Cool® technology, originally featured in Pearl Izumi's high-end P.R.O. line, for optimal cooling and reflective sun protection. The ELITE 3D Chamois® provides comfortable support. Reflective elements increase low-light visibility. 9" inseam (size Medium). Available in various colors. Comfortable, great quality, and good price! 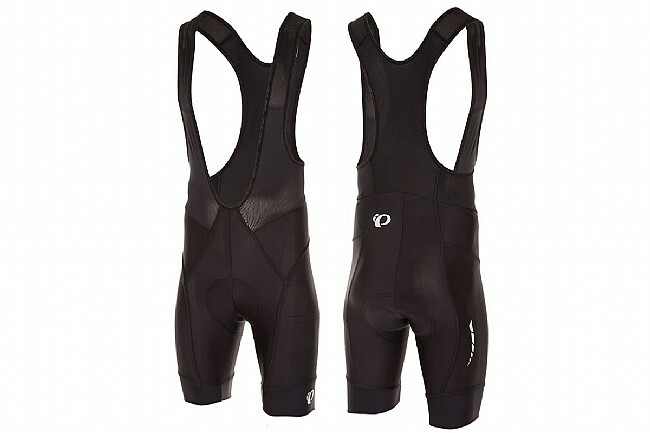 Bib cycle shorts were sized accurately and of expected quality. The order process was painless. The shipping and delivery time was quick and efficient. Seems that the material does not wear well. The short is comfortable however i have noticed that the material in the thigh area of each leg has thinned out. The issue with that is that i do not wear them that often.I would say less than 8 times. So i was dismayed to see that the wear is excessive for the times worn. The shorts were washed with other shorts that did not show this kind of wear. So, personally I would not buy this bib short again. Used to love my Pearl Izumi shorts, now I love my Bibs! For years, I wore higher end Pearl Izumi shorts. I never understood the whole bib thing - more material, more expensive. Well, so many of my friends swore by them, I thought I would give them a try. They are fantastic. No more hoisting up the edges of my shorts as the waistband creeps down. The bibs give me a nice tucked in feeling all around. And with a jersey over the top, no one knows you look like a WWE guy from the 80s. The only drawback would be needing a bathroom break...I have yet to tackle that task, but I imagine it will involve getting mostly stripped!! Not my fav's... but very good for the price. Lot's of material around the torso... average chamois. These short are typical of Pearl Izumi's consistent quality. The cut and fit are comfortable without being too compressive. The chamois is good for a long ride without being too bulky. These are the only bib shorts I will wear. Very comfortable, long lasting and a reasonable price. Was hoping for improved padding. Ride about 100 miles a week for enjoyment.trying to find better padding without the bulk. Very comfortable, great cushioning, stays in place because of the bib. I'm 5-8, 155lbs and the medium fits me well. I'm going to get a pair of the Elite In-R-Cool Shorts to have those too. I'm super sensitive to the feel of material on my body while I workout, and that's why I choose this product. i'm liking this so far. it fits well and is comfortable. i prefer bibs over pants now, but ill note that these are the only bibs i own. Shorts work well. Love the fit, true to size. I wear them 3-4 times a week. Good training short. Definitely recommend, they are a great value. Only negative...needs a small pocket in the back. These are great bibs. Pearl Izumi hits the sweet spot between technology, fit, price and quality. You can spend a fortune on bibs, and I have, but the incremental performance and quality improvements just don't justify the added cost. Even the high-end Pearl Izumi bibs aren't worth it. These are the perfect compromise on all criteria. These bibs seem to fit just right. I'm a guy that is not an elite racer. Rather my BMI is in the healthy range. These bibs give just the right amount of compression to be 'all-day' comfortable. The best way to measure life of bibs is the number of washings they endure. These seem to be just fine in that regard. However, I learned long ago that cool water temperatures and air drying extend the life considerably.